Happy St. Patrick’s Day everyone! As soon as my alarm went off this morning, I flicked on my iPad to see if we had a themed Jumble and sure enough we did! I couldn’t resist the temptation to start the puzzle immediately so I did the clue words first and figured I’d hold off on the cartoon puzzle until I could fetch my morning newspaper waiting for me outside. David chose EXCELLENT clue words that were challenging and perfectly suited for a Friday Jumble. TRIPLE was the only word that I didn’t get immediately but it did allow me to stay in my warm bed an extra two minutes until I solved it so it was well worth it. I started my morning routine and then dashed outside and retrieved my paper from a snow bank. I unwrapped it from it’s blue plastic bag and looked at the front page on my walk back inside. While closing the front door I noticed that they changed the name of the paper from the Union Leader to the Union O’Leader in an all green font and the apostrophe was a clover — classy touch. My pot of gold was waiting for me in the back of the sports section so I thumbed through the pages with haste and there it was! Jeff drew an AMAZING cartoon very fitting for St. Patrick’s Day featuring a leprechaun, a rainbow, and a unicorn all on a field of clover. Absolute perfection and exactly what I had hoped for. I wrote down my clue letters and went to work by reading the dialogue and sentence. David gave us a very cryptic letter layout that had me stumped. I resorted to some self jumbling which led me to find GREEN first. With the leftover letters, THUMB was a quick solve giving us a stinky pun and a great cap to a week of puzzles. I’ll be cooking my corned beef and cabbage later today so if you have any hints or tricks be sure to let me know. Enjoy your Friday and I’ll see you tomorrow! Good morning! 🍀Happy St Patrick’s Day to you.🍀 i get my NY Daily News delivered at 5:15 each morning and found today’s puzzle cute and quick. Then I logged on to see if there was a post. What time as a rule do you post your comments? We host the parade ioday; its 30 degrees here, so cold to be marching! But it’s done every year. And the crowds are unreal. Me? I’ll be watching on TV! Too cold for my Italian blood! Hope your meal comes out delicious. Enjoy! I’m glad I asked about the time! I won’t go looking at 5:30 am! LOL. i didn’t know about the weekends, I’m new to your postings. So, you get Saturday on Friday, but do you get to see the Sunday Jumble? The Sunday puzzle is so good. More of a challenge then the weekly ones. I’m glad to have come across your site, and to see so many others who enjoy Jumble. I’m wondering does this mean we’re all fans of Wheel of Fortune also? To me it was always like an animated Jumble! Again, enjoy your St Patrick’s Day. (I hate to say this but I’m not sure of your name. I think I saw someone call you Mike. Is that correct)? I feel rude not addressing you by your name. Ciao! I did the same thing so the rest was easy. Sorry I meant to say I saw the answer before I did any of the words. Have a good day. Fun day…CB and cabbage tonight at the golf course. Thought the unicorn was a cow,,,,messed me up a tad…..Then wondered if HAMMEY was a word. Using letters from 3 CWs saw GREEN right away, solved puzzle and got MAYHEM and saw unicorn…Fun day..Monsoons starting in Indiana Whew! Mike is your rear end still sore? Good morning. Happy St. Patrick’s Day to all. Mauve was the last word I solved. Today’s theme was perfect for today. Took a few minutes and then the answer just popped into my head. All and all a good start for a new day. Take care. No four leaf clovers in the garden? Loved the St Pat’s day theme – wishing everyone the luck of the Irish. Happy St. Patrick’s Day, everyone! My Jumble Stumble was “triple” which I wrote as “prelit”. Not so on the ball today, so a big “duh” for me. The cartoon was brilliant…!!. Mike, thanks for another great one. I stumbled on mauve but figured out the cartoon first so it came to me when I knew what letters I needed. It amazes me that I sometimes have more difficulty with the five letter rather than six letter words. For those of you who have the Jumble App, David & Jeff just added some new puzzles. I’ve been doing David’ s “Just Two Words” App but don’t like it nearly as much as the regular Jumble. I’m of Italian heritage but an Irish wannabe on St. Patrick’s Day.. 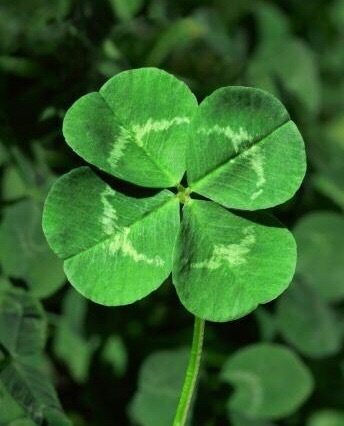 I just read that the odds for finding a for-leaf clover are 10,000 to 1 but may the luck of the Irish be with all of you today. Hi Betty. After seeing your post, I looked for the Jumble App and downloaded it. I would have never known about it without finding this site and reading through the comments. Thank you! I also find the 6 letter words tend to be easier to solve. I think it’s due to the larger words having syllables. Happy St Patrick’s Day 🍀 from one paisan to another! Have a good night! Top O THE Mornin Mike. My Wife used to put a bottle of beer ln while the CB&B was cooking. Enjoy. Happy St. Patrick’s Day! TRIPLE took me 5 times as long as it took you, Mike. Because of no “k” or “y” I knew that “lucky” could not be a word in the answer; quick solve of a delightful cartoon. Mike, you are cooking one of my favorites! Corned beef & cabbage, yum! I invited my sister to go to England, Ireland, Scotland, & Wales with me. On her Ireland to-do list: Drink Guinness on tap. Don’t know whether she liked it better or just wanted bragging rights of drinking Guinness on tap in Ireland. I did not kiss the Blarney Stone, talk enough already. I LOVED the beauty of the Irish countryside. Visions of all that greenery are still in my mind & heart. I had no problem with today’s puzzle ; I enjoy reading all Jumble posts and appreciate you having this site. Just saw an Irish quote “it’s no use boiling your cabbage twice” and never heard that one. My Mom use to say ” I don’t chew my cabbage twice” and guess both mean the same. Good luck with your cabbage and Happy St. Pat’s Day to All? What reference were you looking for? Chuck and Kelly, Mike made a correction to 3/16 puzzle at 8:55 AM on 3/16. To err is human……. !